A shed isn’t just a shed. A shed is a secure place to lock up your expensive tools, equipment and chemicals or to finally get that project complete that you’ve been delaying for months. According to Which, when looking for a shed, there are 5 things to consider; materials, size, sturdiness, weatherproofing and access. We thought we would use these markers to introduce our brand new Dutch Barn. Metal and plastic sheds are relatively maintenance free, a concern for people who don’t have the time, money or inclination to spend time each year annually treating their shed. The problem is, they are not the prettiest of things, and we don’t think you should have to choose between quality and aesthetics when it comes to your garden. That’s why we came up with a solution to give you both: pressure treated timber. We use full lengths of 12.5mm thick slow grown spruce in our Dutch Barn. We’ve seen competitors who glue offcuts together, leaving finger joints which are weaker and don’t look as good. These panes are cut to size before being pressure treated to ensure a better, more even coverage. We see too many products on the market with exposed ends which will absorb moisture and rot the wood from the inside out – it renders the whole process useless. With our attention to detail, you can be sure that your product will remain free from rot and fungal decay for 10 years – in fact, we guarantee it! The floor and roof of the Dutch Barn are made from 10mm MFP boards as standard so there are no hidden costs. This flooring sits on pressure treated bearers. Acting as your primary defence against the damp, insect ridden ground (both killers for timber over time), we wanted to use a treatment that gave maximum protection at minimum effort to you – this is why we chose pressure treatment. By opting for this process, rather than inferior dip treatment, we can be sure that the preservative gets forced deep within the porous Spruce. We even go so far as to have a brown additive added during the treatment process so your bearers are brown, a colour which compliments your garden much better than the natural green associated with pressure treatment. Your shed needs to be spacious in order to store everything you need without having to crawl over things or practically unpack everything to find what you’re looking for. Our Dutch Barn has 5.4m2 ofinternal space to fill with the circular roof making it easier to store the taller equipment. You can even add storage if you wanted to make finding things that much easier. 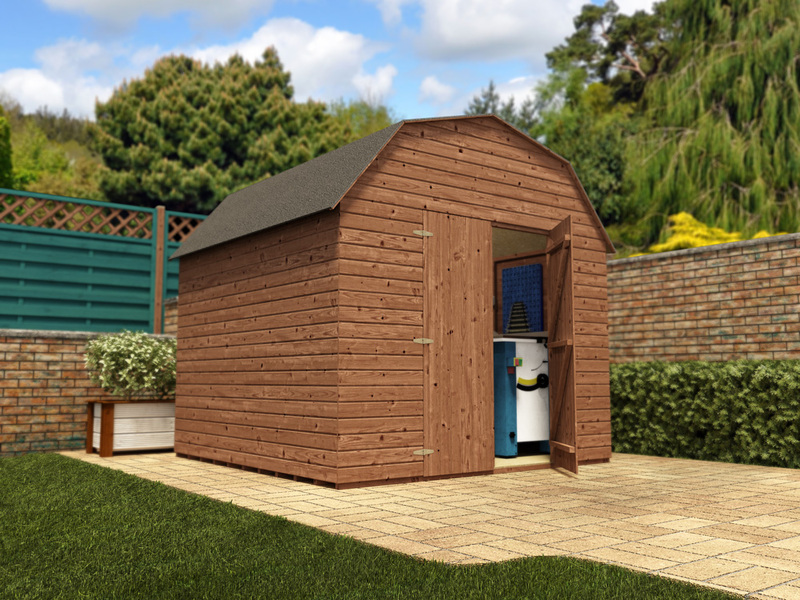 To help you further, each of our products have a feature where you can see the blueprints – it makes it that much easier to plan where in your garden the shed will go, how you will fill it and what to use it for. The last thing you want in your garden is a wobbly, rickety shed that leaves you in constant fear of it falling down the minute the weather picks up. Which? advises that you should check your shed by jumping in the middle, pushing the sides and standing inside it. But, how do you do this when many of our competitors sell them online only? Buy from us of course! The Dutch Barn consists of 35mm x 35mm thick framework which borders 12.5mm thick spruce. These are delivered to you in pre-built panels making construction even easier. You could have it built in a weekend, and still have time to make tea. Even the roof features 86mm x 43mm beams to help support the roof panels further and prevent sagging over time. According to Which? wooden sheds are often likely to leak and rot because of rain running down the walls – not with the Dutch Barn! We use shiplap cladding which features a small lip on each length of timber. This helps the rain drain from the Shed and prevents pooling which can cause internal leaks. We’ve already mentioned the pressure treatment that prevents rot and fungal decay without the need to treat them. We have another secret weapon! To line the roof of your shed and prevent leaky roofs: Superfelt. ‘Superfelt’ is a thicker material made from advanced polyester formula so is resistant to tearing in strong winds. It’s crucial for a Garden Building that will be exposed to harsh, varied, elements for a prolonged period. The roofing material is not only easy to install but has greater nail tear resistance than traditional felt. Thus drastically reducing the risk of having to replace the entire roofing material for a tear during installation. Seems like such a simple request but a lot of people buy sheds online, or from a high street retailer, without truly thinking about the maneuverability. It’s easy to walk inside when both hands are free and you can see where you’re going. How often does that happen in a shed? Normally you are balancing heavy, awkwardly shaped equipment and can’t see where you’re going. Thus, so you need plenty of space to avoid nasty trips or bangs. The double doors of the Dutch Barn open up to an impressive 1.61m (5’ 3”) or 1.17m (3’ 10”) giving you plenty of space to get through with your arms loaded. This also lets in plenty of light when working inside the shed so you aren’t fumbling around in the dark. If you’re looking for a shed that has everything you could need, look no further. Even better, it’s just £669.99 inc. VAT. Ensure you don’t miss out by visiting our website (direct link here) or call us on 01234 272 445. Alternatively, if you would prefer we call you, fill in our ‘Contact us’ page and we will get back to you. As always, feel free to ask any questions in the comments section below.